China’s enemies also came overland during this period. 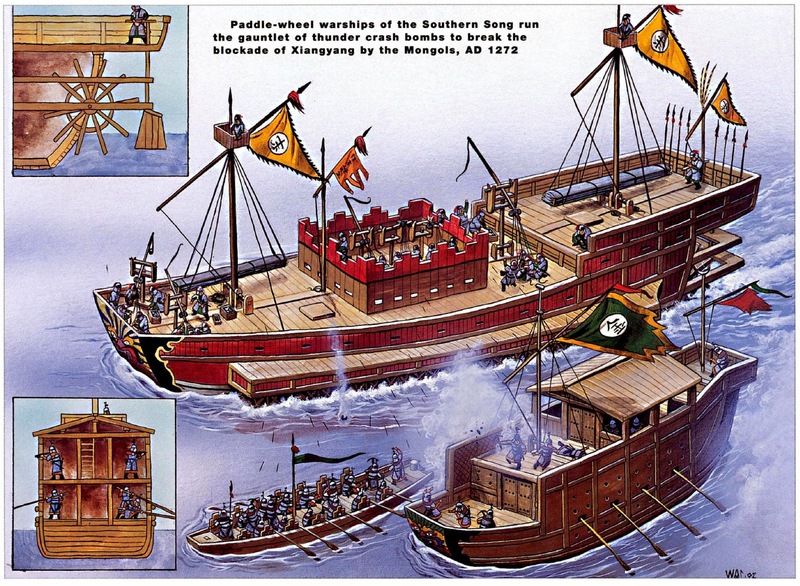 However, as the Mongols pressed southward across the Yangzi (Yangtze) River and encountered Chinese resistance along the coastal waterways, they, too, ordered their Chinese prisoners to construct a fleet. The last Song (Sung) emperor drowned at sea after suffering final defeat at the hands of the Mongol navy. In 1274 and 1281, Mongol ruler Kubilai Khan launched two invasions of Japan with a huge armada of Korean and Chinese built ships that carried 140,000 soldiers during the second expedition. The ships were no match against typhoons, and both invasions failed. Chinese ships, navigated by the compass (first used by Chinese navigators around 1100), with capacity between 200 and 600 tons, dominated the seas, carrying Chinese ceramics and other goods to Japan, Southeast Asia, and southern Asia. Taxes on trade produced the revenues needed to pay the annual tribute to Jin and to pay for the army. Around 1200 the situation in northern China was dramatically changed by the rise of Mongols under Genghis Khan. After uniting the Mongol tribes under him, Genghis began attacking Jin in 1210. His forces took and destroyed Jin Central Capital (modern Beijing) in 1215 and many other cities in northern China. Genghis left the Jin campaign unfinished to turn westward, destroying Xixia in 1227. In 1232 Song repeated the mistake that Huizong had made in 1118 when he made a treaty with Jin against Liao—it made an alliance with the Mongols against Jin, which was destroyed in 1234. However instead of regaining parts of northern China, Song was faced with the formidable Mongols in 1245. Song forces resisted desperately, both sides using gunpowder and firearms. Mongol forces were initially stymied by the strongly fortified Song cities and had problems fighting in the river- and canal-intersected terrain of southern China. The great Song fortress Xiangyang (Hsiang-yang) in modern Hubei (Hupei) province north of the central Yangzi valley held up for four years in 1273. Finally Persian siege engineers and starvation forced Xiangyang’s surrender, which opened up the route to conquer the south. The Mongols also built a navy. The last adult Song emperor died in 1274; two years later Hangzhou surrendered without a fight. Three infant emperors succeeded one another until 1279 when the last one drowned near Guangzhou (Canton) in 1279 as his remnant navy was overwhelmed by the Mongol fleet. Further Reading Gernet, Jacques. Daily Life in China on the Eve of the Mongol Invasion, 1250–1276.